As you probably know, a selfie is a photo that someone has taken of themselves, usually with a phone or webcam, for the purpose of being uploaded to social media. Last week, the Oxford English Dictionary named selfie as the Word of the Year for 2013, noting that use of the word has increased by 17 000% in the past 12 months. Research from the OED has shown that the word selfie is of Australian origin, with the first recorded use of it in an ABC Online forum in 2002. A user named Hopey posted a photo of his bottom lip, which had been injured when he fell over while drunk, apologising for the photo’s poor quality, as it was only “a selfie”. To celebrate this Australian word being so warmly embraced by the rest of the world, there were just two names that came to mind, suggested by Judy’s appraisal of a selfie as “essentially narcissistic”, and because a photograph is a visual echo of its subject. In Greek mythology, Narcissus was a stunningly handsome young hunter, the son of a river-god and a nymph. Many admired him, but he proudly spurned them all, even driving his suitors to suicide – Narcissus is said to have cruelly placed a sword in the hands of one despairing fellow, with the obvious suggestion of what he was to do with it. The best known version of his story is given by the Roman poet Ovid in his Metamorpheses. He tells of a talkative mountain nymph named Echo, whose chattering tongue annoyed the goddess Juno one too many times. Echo had a habit of waylaying Juno with one of her long-winded stories while Juno’s hubby Jupiter enjoyed himself with some nymph or other, giving the nymph plenty of time to escape Juno’s wrath. Juno cursed Echo’s voice, so that she could never speak until someone else did, and when they did, Echo could only repeat what they said, or even just the last few words of their speech. The luckless Echo happened to see Narcissus wandering in the woods, and fell madly in love with his beauty. She longed to eloquently tell him of her passion, but could only repeat his own phrases back to him, which just annoyed Narcissus. She embraced him, and he angrily told her to get her hands off – he would rather die than be caressed by such a thing. The rejected Echo was so ashamed and unhappy that she ran into the mountains and hid herself in the wilderness, until she wasted away with unrequited passion. Only her voice was left, which you can still hear in the hills sometimes – a voice which repeats your own phrases back to you, called an echo. Meanwhile the gorgeous Narcissus continued to reject many nymphs and youths, always in the nastiest way possible, until one of his victims lifted their hands to heaven and implored the gods that one day Narcissus might fall in love, and his love be denied, so that he could know the pain of rejection in his turn. The prayer was answered by Nemesis, the goddess of divine retribution, who punishes arrogance. One day, hot and tired from hunting in the heat of midday, Narcissus stopped by a pool in the forest to get a drink. Seeing his own reflection in the pool, he became entranced by its beauty – those starry eyes! Those flowing golden locks! That ivory skin and rose-leaf complexion! Those sweet pouting lips! Yep, the vain Narcissus had fallen head over heels at last – with his own image. He tried to embrace the stranger in the water, and to kiss him, but although the reflection seemed as eager as he, smiling whenever he did, and offering his lips in return, Narcissus just ended up with his face in the pool, wet and ridiculous. Tortured by his love, he longed to die, and wasted away by the pool, consumed by hopeless desire for himself. The nymph Echo, now a mere disembodied voice, still loved Narcissus, even as his beauty withered away with neglect. She watched over him, and pitied him in his plight, managing to whisper a sad “Farewell!” to him as Narcissus died and said goodbye to his reflection. Death brought him no relief, for in the afterlife he continued to miserably roam, gazing at his reflection in the underworld River Styx. When Narcissus’ grieving sisters came to collect him for his funeral, they found his body had disappeared, and in its place was a beautiful narcissus flower, its drooping head still looking into the pool at its own reflection. Narcissus is a genus of spring bulbs native to the woodlands of Europe, West Asia and North Africa. Coming in a range of colours from white through the yellows to dark orange, we call some varieties daffodil or jonquil. The meaning of Narcissus is not known – the Greeks understood it as meaning “I grow numb”, as if it was related to the words narcotic and narcolepsy. However, this isn’t accepted by scholars, who believe it is more likely an attempt to understand a word originally from another language, most likely one from the Near East. Although legend says the flower’s name came from the mythological character, it is almost certainly the other way around, with Narcissus named after the flower. The name Narcissus wasn’t uncommon in ancient Greece. Narcissus was a wrestler who assassinated the Emperor Commodus, and is one of the inspirations for the movie Gladiator starring Russell Crowe, while another Narcissus was the slave of the Emperor Claudius, became his personal secretary, and had a lot of influence over him. There are several saints named Narcissus – Narcissus of Athens is mentioned in the New Testament as one of the Seventy Disciples of Christ, and an assistant to Saint Andrew. 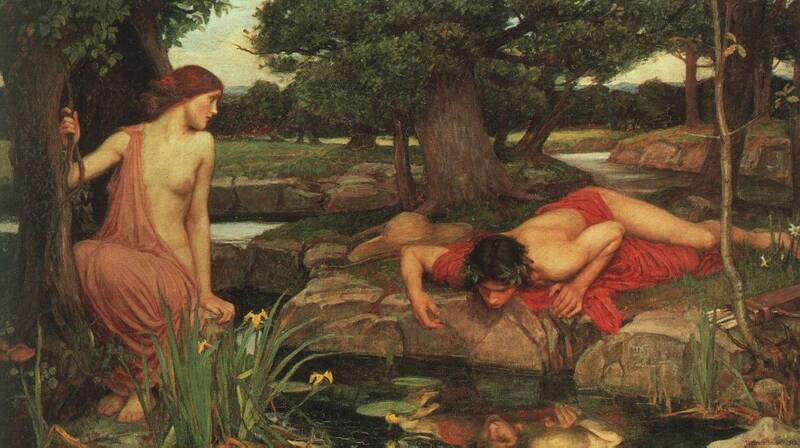 In modern times, men named Narcissus were more likely named after one of the saints than the mythological character. However, Narcissus is actually far more common as a female name, because of the flower. One of its many issues is that it has given rise to the term narcissism, to describe inflated self-regard – although some degree of narcissism is probably normal and healthy, when it goes overboard it is seen as a psychological disorder. The word Echo is from the Greek and means “sound”. Just as with Narcissus, the mythological nymph is named after the word, and not the other way around. There is a Marvel superheroine named Echo (she’s deaf), and Echo is the lead character in the television drama series, Dollhouse. An Australian connection is Echo Point in the Blue Mountains, a wonderful place to hear echoes. Because an echo is a vocabulary word as well as a character, it has sometimes been given as a name to boys, and OH- ending names are fashionable for both sexes. One of the issues with the name Echo is that there is a car called the Toyota Echo. Can you imagine ever using one of these names from Greek mythology? POLL RESULT: Narcissus received an approval rating of 13%, making it the lowest-rated boys name of the year, and the lowest-rated name overall. Echo did much better, with an approval rating of 58%. I agree with Blue Juniper- Echo sounds a lot more “wearable” than Narcissus. I actually know a little girl aged about 4 with this name (and a brother named Ossian) and she absolutely rocks it. Echo and Ossian are such a super-hip sibset! I loved this story – it was in a childrens guide to Greek Myths I had when I was younger, and always struck me as so sweet yet tragic. I don’t think I could ever use Narcissus. It’s pretty, but narcissism is considered to be such a negative trait that I think it would be very hard to wear. I like the name Echo – but I could never use Narcissus either. Mostly because the character Narcissus is so horrible! It obviously didn’t bother the ancient Greeks, but it would bother me.